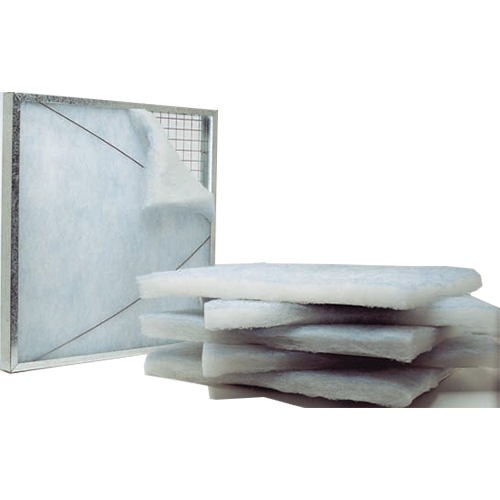 Glass and Synthetic filter media for HVAC systems and spray booth deckhead and exhaust applications. This media is available in bulk rolls or pads for use in re-loadable frames or cut to specific customer requirements. Also available as roll filter refills. Glass Media - The media is manufactured from continuous monofilament glass-fibre bonded with thermosetting resin.The pattern of the fibres is designed to give the lowest resistance to air whilst offering the highest dust holding capacity. Synthetic Media - Consists of 100% Polyester fibres, which are thermally bonded for optimum filtration efficiency and to avoid fibre shedding. Available in a wide range of media types and thickness and can be supplied as pads or refills to fit all makes of Roll-Filters.